A ghost-hunting reality TV crew investigates a reportedly haunted sanatorium on the anniversary of a brutal murder-suicide. Day 1 – 12/29 – The “Ghost Trackers” cast/crew relaxes at a bar before beginning production on their 100th episode. The cast/crew consists of Tyler, Cole, Mark, Bridget, and Samantha, who is pregnant with Tyler’s baby. Day 2 – 12/30 – The crew heads to Hillcrest Sanatorium and meets caretaker Irwin Stacks. Irwin tells the team that the front door is padlocked and it will be another day before someone can come to cut it and allow everyone inside. In the meantime, the team looks around the campus exterior. Cole thinks he briefly sees a child in one of the upper floor windows. In the middle of the night, a file on the facility is left for the team at their hotel. Papers and pictures detail the case of Richard Howe, a Hillcrest patient who murdered three children before hanging himself on New Year’s Eve in 1955. Day 3 – 12/31 – Irwin takes the team on a tour of the building. Irwin recounts the facility’s history of having lost over 1,000 patients to a tuberculosis epidemic known as the “White Plague” after being built in 1908. In 1976, the building was refitted into a now abandoned nursing home. Since falling into disrepair, rumors abound of strange disappearances on the site. Irwin leaves the team to set up their equipment and begin their investigation. Over the course of the evening, various instances of paranormal activity plague the crew, including an instance of Cole momentarily becoming entranced by a spirit. Day 4 – 01/01 – After celebrating the turn of the New Year at midnight, the investigation continues. Samantha joins Cole and Mark in the room where the three children were murdered after the men capture EVP recordings of little girls’ voices. Bridget watches via surveillance feed as Tyler encounters a presence in Richard Howe’s former quarters. Tyler vanishes, although his last recorded video shows what appears to be him being hanged in a manner similar to Richard Howe. Bridget is assaulted by an unseen presence. She, Samantha, and Mark go in search of Cole after he runs away in a panic. Bridget becomes separated from the group. Mark and Samantha attempt to flee in their van, but return to the building when they spot Tyler. Mark is attacked and dragged away into the darkness outside. Samantha goes back inside as various fixtures begin collapsing. Finding a pool of blood in one of the rooms, Samantha looks up to see all four of her dead friends hanging from the ceiling. Samantha is then overcome, attacked, and killed by an unseen presence. In a mid-credits flashback, Mark and Cole secretly capture video of Irwin speaking to an unseen presence inside the sanatorium. No sooner did I finish reviewing the UK first-person thriller “Final Prayer” (review here), during which I took a cheeky swipe at grumblers who unfairly dismiss “found footage” out of hand on principle, when “Sanatorium” tosses egg on my face and crams crow down my throat. While many horror fans have deemed the format played out, I’ve long held that a moratorium on “found footage” simply because so much of it is derivative throws the baby out with bathwater. Then along comes “Sanatorium” embodying everything charmless about the subgenre to remind true believers why it is near impossible to convince “found footage” naysayers that a new trick could ever come from an old dog. I have previously questioned why anyone who dislikes “found footage” films would not simply avoid them rather than suffer the consequences just to deride them on a message board after the fact. I don’t dislike the format at all, but I didn’t follow the spirit of my own counsel when the “Sanatorium” cover art all but screams how clichéd its entire package is. A levitating woman contorted in a backwards pose. Empty wheelchairs abandoned in deserted hallways. Even a jaundiced hue to the backdrop signaling copious amounts of green-tinted night vision. Well, at least they didn’t film inside Linda Vista Hospital. Stop me if you’ve heard this one before. Better yet, stop any filmmakers who think this is still a worthwhile premise for a horror movie. The five-person cast/crew of “Ghost Trackers,” a paranormal investigation reality TV show, has the reportedly haunted Hillcrest Sanatorium in the crosshairs for their 100th episode. No shortage of nefarious deeds once took place at the facility, starting with the deaths of over 1,000 tuberculosis patients and culminating in the New Year’s Eve murder-suicide of a madman and three children. That latter point is a detail the “Ghost Trackers” team seemingly does not know until a mysterious file is left at their hotel doorstep on the eve of shooting. Lo and behold, they happen to be starting production on December 30th, the day before the gruesome crime’s anniversary. What a coincidence. Caretaker Irwin Stacks explains that in 1974, the sanatorium was renovated into a nursing home. Too bad he never explained that to the Production Designer, because wings where afflicted children were housed still hold their discarded dolls and the exsanguination room in the basement is kept largely intact. You would have to really have it in for your elderly parents to sentence them to whittling down their twilight years in a gloomy tomb that essentially remains a monument to medical horrors. Despite it being their centennial episode, the “Ghost Trackers” cast feels the need to explain on camera how motion detectors work. Somehow, the audience is expected to believe that the crew has been at this for nine years even though one team member has to ask where to place the generator and another mistakenly refers to night vision as infrared multiple times. Usually, paranormal investigation team members have designated purposes, e.g. psychic, historian, scientist, tech engineer, or expert of some sort. These are merely five non-credentialed friends futzing about in the dark and they couldn’t pass as seasoned supernatural veterans or television production professionals if lives depended on it. The bright spot in the cast is DJ Hazard as groundskeeper Irwin Stacks. This is the first caretaker in a “found footage” haunted hospital movie who doesn’t try preventing the crew from going inside or offering a cryptic warning about not disturbing unseen forces. Hazard makes Irwin an affable Everyman who believes in ghosts, yet insists that Hillcrest isn’t actually haunted. The nonchalant way he responds with, “I think it’s just cold ‘cause it’s winter” regarding misperceiving temperature drops as chill spots is a refreshing change of pace for a role normally reserved as a portent of evil to come or a momentary roadblock for the protagonists. A free pass can be granted to the introduction for pointlessly killing time with a drunken pretzel-eating contest and gross-out game in the local tavern. That’s only because similar movies generally indulge in at least one bonding scene to go through the motions of pretending these are real people with personalities worth connecting to. But “Sanatorium” continues padding itself to feature length with additional go-nowhere segments like the team becoming lost on their drive for less than 60 seconds of runtime or a crewmember temporarily hobbled by an exposed nail. That latter character doesn’t even end up with a limp and the former inability to read a map never plays a part in anyone’s characterization down the line. Countless nonevents like these leave the audience questioning the supposed story value of such senseless scenes. The investigation itself could not be any more rote if everyone involved were sleepwalking, which is what the movie is doing anyway when it comes to its paint-by-numbers screenplay. “Sanatorium” is overstuffed with excessive tiptoeing past peeling paint while EMF detectors are held at arm’s length. A surveillance system regularly cycles through the same series of static camera shots even when nothing is happening, which is most of the time. Every element is lazily plotted simply because “Sanatorium” is only following in every previous “found footage” film’s footsteps. MGM continues making James Bond movies and audiences continue seeing them even though everyone knows their predictable patterns, right down to how many exotic ladies the super spy will bed in between a high speed chase and a rendezvous with M. What 007 does not do is find himself tasked with foiling the exact same villain’s exact same plan with the exact same gadgets on every single outing. There is a difference between following a formula and following a point-by-point blueprint to the letter, and “Sanatorium” has no idea what that difference is. It is no surprise then that the film is an uninspired retread of a boring asylum investigation serving no meaningful purpose and possessing no unique aspect to call its own. 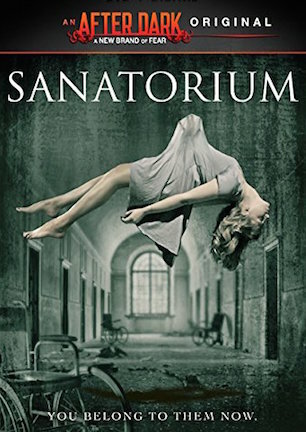 Finishing with a screaming metal song to accompany the end credits, “Sanatorium” proves it has not a single creative thought in its head for coloring near the lines, much less outside them. Should anyone need affirmation as to why “found footage” has an unfavorable reputation, “Sanatorium” can punch that ticket with commanding force. January 6, 2015 by Ian Sedensky.